The end of November is always a special time of year as people are getting ready for the holidays, businesses are closing out the 4th quarter and preparing for the new year. November was also a very special and productive month for signageOS as the development team began to prepare for the new year and new customers! Some of the most prominent updates for November include a redesign of the verification screen for on-boarding, the inclusion of visible IP addresses for verifying devices, and a get command for device network properties. To view the updates and features as they are made available, become a partner with signageOS today by heading here. The most important updates for the front-display involve the verification screen and device network properties. The verification screen is now completely free of any branding so companies can use their own custom branding if desired. Also on the verification screen, the device's local IP address is now visible. This feature enables users to easily ensure the verification of new devices by displaying the IP address during the verification process without the use of the display's remote controller. Additionally, there is a new getNetworkInfo command for attaining all device network properties. The last two updates involve the pre-loading of content when there are multiple applet timings and a new API for decompressing ZIP and other file formats. Many of the updates within the Android platform involve minor fixes like uniformity in error messages across display and media player types or the stuttering of video on a single display line. More interestingly, BenQ, Lenovo, Panasonic, and Technovare no longer require a companion app to install firmware updates enabling more efficient update scheduling. Also, brightness settings now take effect immediately instead of having to refresh or reboot the display. Simultaneous downloading of the same file from applets is now fully functional as well. Only show unreleased front-applet versions to admins. The Box received an upgrade with the screenshot feature by enhancing the overall usability of the screenshot (e.g. slow preview, fast preview, stop preview) and providing a history of screenshots to ensure the content was correctly displayed over time. Also, Admins are now the only users that can see unreleased Applet versions. Applet Dispatch commands (Timing commands) POST can be done to any applet even without organization access. And last but not least, among the API's newest updates is the ability to alter dispatch commands for a created applet without requiring organization access. We hope these new updates and features get you as excited as we are. 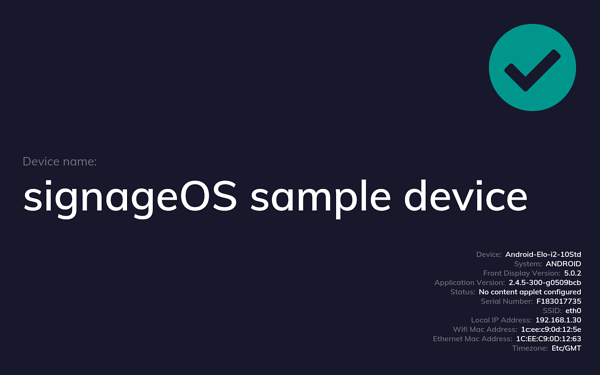 The progression of the signageOS development is something to definitely pay close attention to so if you have a question about an update or feature, let us know. We will be happy to get the conversation started with you. Copyright © 2017 signageOS. All rights reserved.